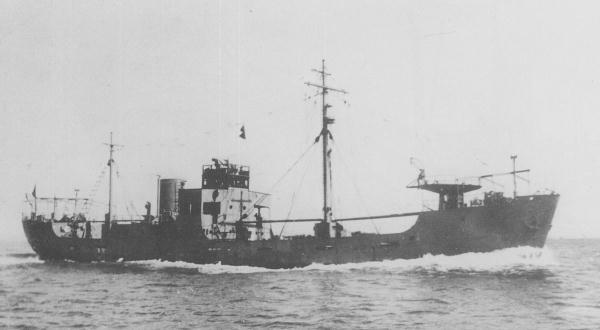 The Imperial Japanese Navy enrolled a number of food supply ship for service.The Nosaki was the only ship for her class. During 1939, the necessity of deliver fresh fish for the fleet and army in the China area motivated to the IJN to purchase two new food supply ships under the Maru 4 Programme. While the Kinesaki (support vessel No. 4006) had 1,000 ton, the Nosaki (support vessel No. 4007) was smaller with only 600 ton. Because the main purpose was to transport fresh fish, they had a large freezer in the hull. Therefore, the overall shape was more like a fishing trawler. After comparing the specifications of both ships, the IJN concluded that it was more useful to produce the Kinesaki-class vessels in larger numbers. The Nosaki was laid down in Shimonoseki shipyard on 18 October 1939 and launched in July 1940. Interestingly, her name was changed to Nankai in October 1940. When it was completed on March 1941, she was assigned to the Sasebo Naval District. She was again renamed as Nosaki and assigned to the Kainan Guard District in April 1942. Her duties involved transportation operations in China Coast, Taiwan and French Indochina areas until she was sun on December 1944 by the submarine USS Dace off Cape Varella.